Tulane University researchers have published an important study concerning captive frog nutrition that should be of interest to all amphibian and reptile keepers. A colony of Strawberry Poison Frogs (Oophaga pumilio) was maintained on a diet comprised of fruit flies. When carotenoids were added to the fruit fly diet, the frogs produced significantly more eggs, and a greater number of tadpoles survived through metamorphosis. The Vitamin A deficiency found among some of the animals was also reversed. 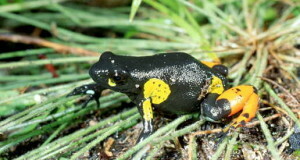 Nutritional deficiencies are common in both private and public amphibian collections, partly because of the limited dietary variety we are able to provide. Adding carotenoids (which are pigments produced by plants) to the diet of feeder insects may be a simple means of improving health and reproductive output – especially important in these times of unprecedented amphibian declines. Please see also the links under “Further Reading” for other articles I’ve written on supplementing cricket diets with carotenoids and Vitamin A deficiency in frogs. Various plant pigments known as carotenoids are responsible for the yellow-orange color of egg yolks and skin among a huge array of animals. They also play a role in neonatal health, benefit the immune system by acting as antioxidants and function in the reproductive system. Animals cannot manufacture carotenoids but rather must obtain them from their diet. In the Tulane University study (Zoo Biology, V32, N6), the fruit fly medium’s carotenoid content was increased by the addition of Spirulina, red phaffia yeast and powdered marine algae. Studies have also shown that the provision of fruits and vegetables increases the carotenoid content of crickets; please see links below. Sixty-two pairs of Strawberry Poison Frogs were included in the study. 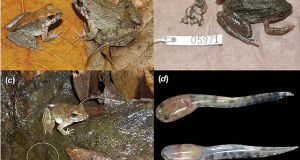 The increased tadpole survival was attributed to higher quality eggs being produced by female frogs. Infertile eggs, which are deposited by females as food for their tadpoles, were also believed to be of higher nutritional value following carotenoid supplementation. A number of the animals were found to suffer from a Vitamin A deficiency. This condition was reversed over the course of the study. Many animals convert carotenoids to Vitamin A, so it is theorized that the addition of carotenoids to the fruit fly medium was responsible. As many frog enthusiasts know, the all-too-common condition known as “Short Tongue Syndrome” has been linked diets low in Vitamin A. If your frogs or toads are having difficulty catching insects, please see the link below, or post here for further information on this disorder. Do Your Frogs have Trouble Catching Insects?